Torquil Campbell has built up quite a name as a member of the Montreal pop rock band, Stars. The band has hit their milestone of creating alluring tunes for a decade. Yet, that is not the only hat he wears. With a fellow artist Chris Dumont, he has created a different history with a duo called Memphis. 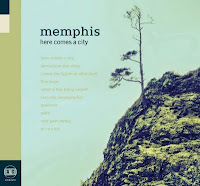 With the recent release of their latest album, 'Here Comes a City', Memphis revisited Toronto with the opening bands, Freedom or Death and Paper Lions. The stage presence of Campbell was in a grip of force. He was clearly the centre of attention during the entire set, right from the very beginning when he hushed the audience before ringing a bell. He stormed out compelling voices injected with emotions, escalating as he sang from the bottom of his heart. "This might be one of the best shows that I've performed! ", Campbell exclaimed. He seemed impassioned to perform at Lee's Palace with familiar faces (his wife and friends) in attendance to witness his performance that very night. The duo continued sharing beautiful melodic tunes from their latest album, including 'I Want the Lights on After Dark.' I can't forget to mention the cohesiveness of the sound with both the due and the back band, as the chemistry between them was almost palpable. However, by the middle of the show, I couldn't help feeling overwhelmed by Campbell's presence. Dumont quietly shadowed himself with the back bands. There was a point where I couldn't tell if he was a part of the band or a back-up for Campbell. I almost felt like it was a one-man show.